Ayurveda is a combination of two Sanskrit words. (Ayur and Veda) Ayur means Life and Veda-means-Science of Wisdom or knowledge. It is considered the oldest treatment system of the world, originated from ancient India about 3000 to 5000 years ago. This system of treatment is adapted according to nature’s law to maintain health and prevent illness and keeping the body, mind and soul in a perfect equilibrium. According to Hinduism, the creator of the universe, Lord Brahma (One of Tri Murtis), granted this to Daksha who granted to mankind through the Gods and sages (Rishies). According to Aryan culture, there are 4 vedas, which includes four tentacles which is given by Lord Brahma in the beginning at the time of Kaliyuga, which introduced 4 Upavedas. Ayurveda is said to be a sub-branch of Adharva Veda, one of the Four Vedas which gives the solution to all kinds of diseases and distresses of the body. This system of medication practiced in many centuries and developed by experience was handed over to generations. Ayurveda medicine is the oldest surviving, healing system of the world. This system of medication was practiced for thousands of years. The practices of this method include health care of physical, mental and spiritual of human, through a natural method and it is the main attraction of this alternative treatment method, so this method do not process any side effects compared to any other chemical treatments. 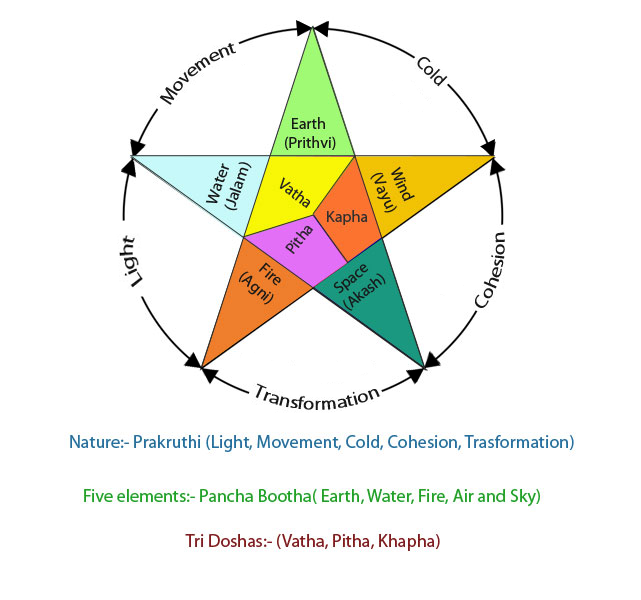 According to Ayurveda the Major cause of illness is the imbalance of our body type (Nature-Prakrit) by the influence of five elements (Air, Water, Fire, Space, and Wind) of three factors of body humors called ‘Tri doshas’ which is ‘Vatha’, ‘Pitha’ and ‘Khapha’. The meaning of the Sanskrit word Vatha is Air, Pitha is Body bile chemicals and Kapha is Mucus. It can be changed by the influence of climate or any other reasons make the imbalance make to cause illness. Each person has their own natural body state or the natural combination of these three elements vatha, pitha and kapha, it should seek balance by modulating their behavior or the environment. Because they are not in their natural state of equilibrium, This can be explained through an example, in cold season we are getting coughs and cold, which are increasing our mucus (Kapha), according to the science of Ayurveda cold can be reduced by heating, for this purpose heat can be created in our body by using of hot nature herbs like Black pepper, Long pepper, Ginger etc., thus it can reduce excess kapha and make a balance. The eight types of treatment in Ayurveda. The backbone of Ayurveda medicine is herbal plant; medicines are prepared from roots, leaves, fruits, barks and seeds, or from some minerals and metals, some animal substances may also be used in some medicines and treatments. For example, milk of different animal (or its by-products like butter, Ghee, curd etc. ), bones, teeth, horns, urine and dung of different animals, civet, shellac and shells of creatures, etc. There are different types of Ayurvedic medicines are available, for example, Arishtas, medicated oils-(Thilam, Enna, Keram) Asavas, Bhasmas etc. Various oils could be used in a number of ways for example massage oils, hair oil intake medicated oils for Snehapanam treatments. For the preparation of some Ayurveda medicines, preserves herbal medicines (Angady Marunnu) also can be used. It would be better to consult an Ayurveda Doctor or an Ayurveda Medical Practitioner before taking medicines, Improper use of some Ayurveda medicines may harmful to us. Traditional practitioners of Ayurveda in Kerala (South India) are called Vaidyas, who practiced this method for centuries were the healing system for the people in Kerala. Kerala is the one of the richest medicinal plant hub in the world. The good climate of Kerala helps to grow and survive medicinal plants without any damage; natural abundance of forests is another reason. The specialty of the soil keeps the potency of herbal medicines than other places. In Kerala Ayurveda is a lifestyle which keeps the people in a good health in a natural way. We can see this treatment system and methods are described in old texts like Ashtanga Hridaya, Charaka Samhitha, and Sushrutha Samhita, were written thousands of years ago.